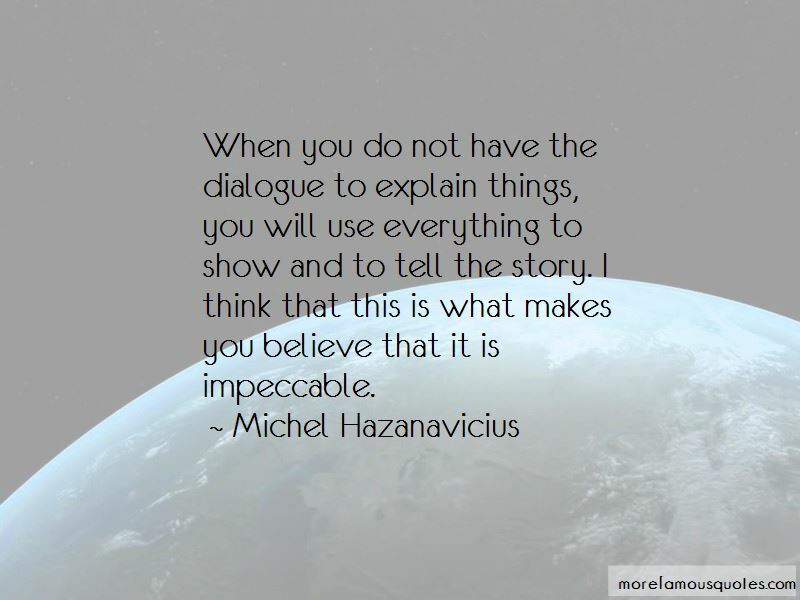 Enjoy the top 55 famous quotes, sayings and quotations by Michel Hazanavicius. I only have one obsession - not to be boring. I love silent cinema but don't hold it sacred. Like any branch of film there are some very boring films alongside the masterpieces. But sometimes I think you have to try to do things that people don't think are doable. This is the problem with language, and this is what makes silent movies fun, because the connection with them, me or the audience is not with the language. There's no question of interpretation of what we are saying it's just about feeling. You create your own story. When we were making the movie, winning awards for it wasn't the point at all. We didn't even have an American distributor. I think being a foreigner and talking about Hollywood allowed me to use some cliches and some references that an American would maybe not use. Maybe I've seen more Hollywood movies than French movies. Robert DeNiro, who may be the greatest living actor, usually acts in a way which is very stone-faced, like Steve McQueen. They said 'if you have a 3D movie, we'll buy it' because they want it. For maybe two weeks I really thought of a silent, black and white 3D movie and I thought it could be great. I imagined it as a very special image, a very new image, but fortunately, I didn't have to do it. It's not my job. The Weinstein company, it's their job to convince people. My job was to make the movie. That's what I did. I know what we did in France was to have the maximum screenings just to let people talk about the movie and say they enjoyed the movie. There are two kinds of audiences. There's the ones who were in the theaters, and the ones who are outside and we want them to come inside the theater. And, it's not the same. I think Hollywood is cleverer than you think. I'm not sure they will do it. I don't think so, but maybe I'm wrong. When we were doing the preparation of the movie, we didn't have all the money so we were looking for all the solutions possible, and 3D was one option. 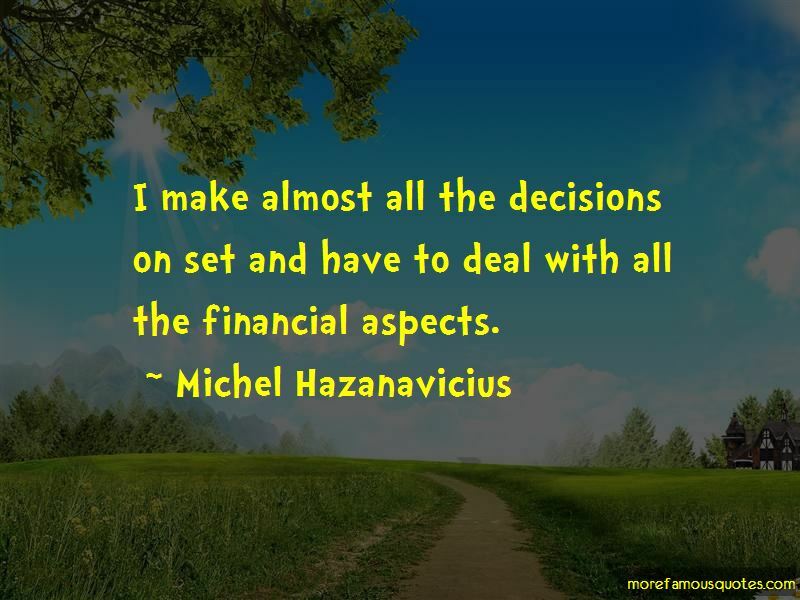 Want to see more pictures of Michel Hazanavicius quotes? 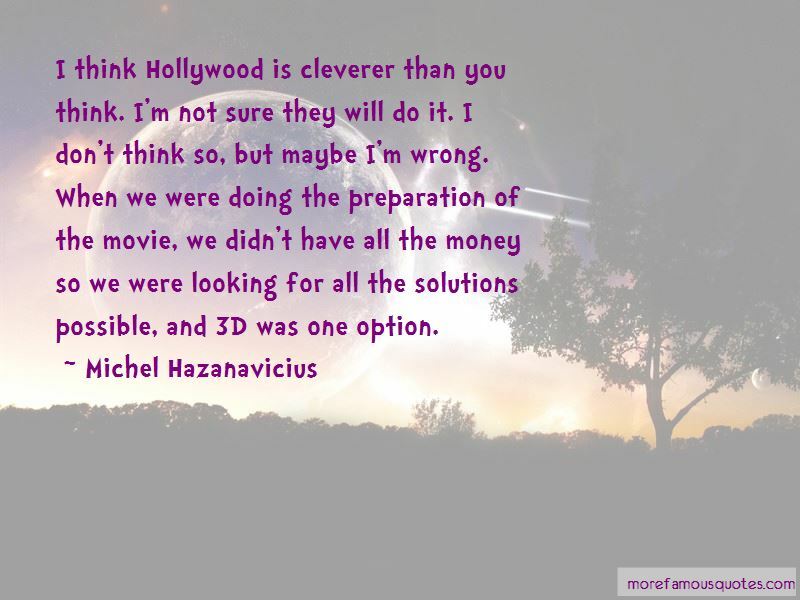 Click on image of Michel Hazanavicius quotes to view full size.